Here's a little word-association quiz for you. What's the first thing you think of between the words "stainless steel" and "automobile"? If you're like most car buffs, you probably came up with "DeLorean" or, if you're really into cars, possibly "the roof of the 1958 Cadillac Eldorado Brougham," right? But how many of you associated "stainless steel" with "Fords"? Not many, I'll bet. That's because very few people are aware that three Ford models were fabricated in stainless steel. They were built for special promotional and marketing purposes and owned by Allegheny Ludlum Steel. These special stainless steel Fords included the 1936 Ford Deluxe, the 1960 Thunderbird and the 1967 Lincoln Continental Convertible. Here's the history of how these stainless cars came about, according to Allegheny Ludlum Corporation. 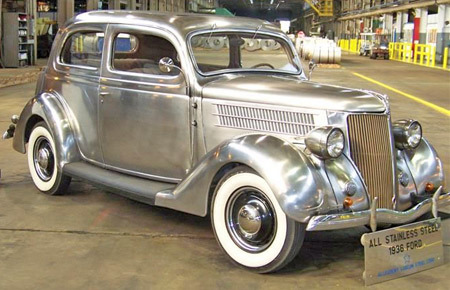 In 1935, company officials of the Allegheny Ludlum Steel Division and the Ford Motor Company collaborated on an experiment that was to become a legacy and a tribute to one of the most dynamic metals ever developed. Allegheny Ludlum was a pioneer producer of stainless steel and proposed the idea of creating a stainless steel car to Ford. The decision makers at Ford liked the idea and it became a reality in the form of a 1936 Deluxe Sedan. The Stainless Steel Deluxe Thirty Six became the centerpiece of a campaign to expose the public to the new metal and its many uses. The 1936 Ford Deluxe never looked as good in paint as it does here with the rich natural patina of stainless steel. Of the six originally produced, four still survive. In all, six of these cars rolled off the Ford assembly line in 1936. Of the six, four still exist today giving testimony to the proof of stainless steel's durability. These stainless steel cars were perfect vehicles for increasing the public's awareness of the quality of the metal. One of these four survivors is on display at the Heinz Regional History Center in Pittsburgh, PA. The top salesmen each year were given the honor of being allowed to drive them for one year. Powered by the standard 85hp Ford V-8 engine, they were reputed to be surprisingly smooth and quiet. Each of the original six logged at least 200,000 miles with Allegheny Ludlum officials behind the steering wheels before they were 'retired' to private ownership in 1946. Thousands of additional miles have been logged on the odometers since, and their shiny bodies have outlasted most of their non-stainless steel parts. A retired Allegheny Ludlum employee said that the dies were ruined by stamping the stainless car parts, making these the last of these cars ever produced. The smooth curves are obvious in this rear view of the stainless 1936 Ford and really show off the beauty of the metal, which competes very successfully for bling points with the chrome of the bumpers. Allegheny Ludlum and Ford later collaborated on two more stainless models. The next one was the 1960 Thunderbird, and two of these cars were produced as another experiment to further raise public awareness of stainless steel by touring it around the country. They both rolled off the Wixom, MI production line on July 11, 1960. 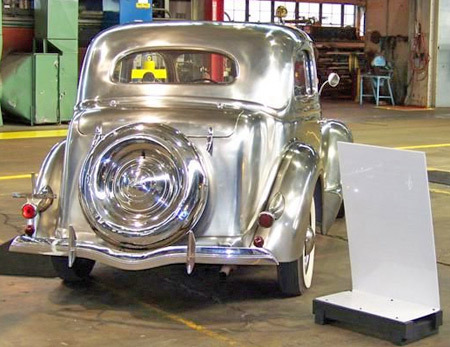 The experiment was a success on a number of levels and public awareness of stainless steel's many uses increased with every city and state the cars visited. Two stainless 1960 T-Birds were built and toured extensively as part of the PR campaign to raise public awareness of stainless steel. They still look as good today as when they rolled off the assembly line (Photo courtesy of ATI). Since 1960, when the two stainless steel Ford Thunderbirds were introduced, they have been displayed throughout the United States and Europe. With the exception of the body skin, bumpers and grille, which are made of T302 stainless steel, every other component is standard 1960 Thunderbird equipment. Also included is the first T409 solid stainless steel muffler released on a production vehicle. Both cars still have their original mufflers and T304 exhaust pipes after 49 years on the road! Then, in 1967, three Lincoln Continental Convertibles were the last of the stainless steel cars produced by the Ford Motor Company and Allegheny Ludlum Steel. As with all stainless steel, there was no need for painting since the corrosion-resistant properties of the stainless eliminate the problems caused by rust. Three 1967 Lincoln Convertibles were the last of the stainless steel cars produced by the Ford Motor Company and Allegheny Ludlum Steel. Allegheny retains two of them and they're still used for special guests and other promotional purposes. (Photo courtesy of ATI). Except for the vehicles' bodies, all other parts and equipment on the cars were standard for the 1967 Lincoln Convertible. The vehicle weight is just about equal to one with a standard steel body. Allegheny Ludlum Steel retains two of the Lincolns and still uses them for customer visits and special events. A complete set of stainless automobiles (1936 Deluxe, T-Bird, and Continental) are on permanent display in the Crawford Auto Museum in Cleveland, Ohio. And of the 11 total stainless steel cars built, 9 are still in use. So, you see, there's more to stainless steel when it comes to cars than Caddy Biarritz roofs and DeLoreans.